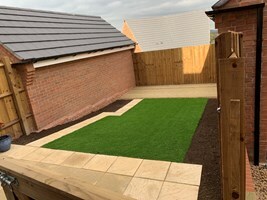 J Lee & Sons - Landscaper based in Langar, Nottinghamshire. J Lee & Sons is a family run business. We have 12 years extensive experience of all types of home maintenance. All work is carried out to a high standard by our reliable and friendly team.. No job is too big or too small. Here at J Lee & Sons we specialise in Artificial Grass, Turf , all types of Fencing & Patios. Our clients include The Duchess of Rutland at Belvior Castle, & Langar Woods Park Home EST. The price we quote is the price you pay. There will be no hidden extras.